What a great day! Last Tuesday we held the 3rd annual CENGN Summit. The success of this event continues to grow each year as we had record attendance with over 300 people present. This year’s theme – Prosperity Through Connectivity – was focused on exploring the link between next generation networks and prosperity by looking into the state of the ICT industry in Canada and establishing why this sector is so important to the strength of Canada’s economy. Attendees had the opportunity to hear from ICT leaders across Canada who discussed the positive economic and social impacts that next generation networks are having on our country. The event truly brought the innovation ecosystem together with representatives from multinationals, SMEs, academia, government, venture capital, and other supporting organizations. The CENGN Summit is an important event for Canada’s ICT sector as it creates a forum for dialogue on topics of critical importance to our industry. 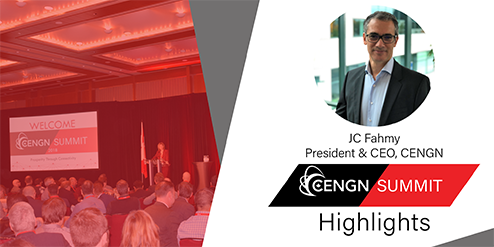 By bringing together decision-makers from all corners of CENGN’s ecosystem, the Summit enables conversation on successes, areas for improvement, and potential solutions to specific problems that organizations in Canada are facing. Common themes discussed throughout the day included how today’s tech organizations need to adapt to the rapid pace of innovation; the importance of broadband internet access for all including northern and rural communities; and how next generation network advancements are transforming businesses and organizations in all sectors, including health, mining, and manufacturing among others, and driving the economic strength of Canada. The crowd was also treated to outstanding keynote presentations on the use cases of next generation networks. Jacob Glick of North Inc. showed how next generation networks enable different applications for consumers, as exemplified by his organization’s smart glasses. Robert Bauer of AIG articulated how advanced networking and related technologies are equipping us to know more than ever before and with greater certainty. The event also facilitated several partnership opportunities for attendees as the foyer was consistently packed at the breaks. Several times during the day I was able to witness our multinational member companies talking with SMEs who have completed a project at CENGN. This was something significant to see as these types of connections and partnership opportunities are what CENGN aims to create. I would like to sincerely thank all of our sponsors, speakers, attendees, the CENGN team, and everyone who made the day an incredible success. The ongoing support CENGN receives from our funders, members, and partners is critical to our organization and contributes to the success of our SME customers and the Canadian economy. It was great to reconnect with so many of you at the Summit. There is substantial opportunity for the Canadian ICT community to develop our country’s competitiveness on a global scale. Whether it is scaling our innovative SMEs, training industry professionals and students, or partnering on other technology initiatives, CENGN looks forward to collaborating with you for the benefit of the Canadian ICT sector.